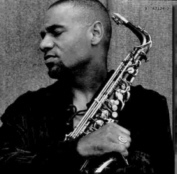 "Kirk Whalum" puts the "smooth" in smooth jazz with this album covering recent pop hits from artists such as Mariah Carey, Brian McKnight and Whitney Houston. For those who might not be familiar with Kirk, he's the one who played the sax solo on Houston's smash hit "I Will Always Love You." This is his ninth album, having recorded his first five for Columbia, before moving to Warner, where his first album was the Grammy nominated "Joined At The Hip" with Bob James. Softly opening the album is McKnight's, "Anytime," as Whalum plays like a lover whispering in your ear. It would have been even better if Paul Brown's mixing didn't make the background music sound like an insistent alarm clock. The next track, Maxwell's "Ascension," sounds much better by comparison. and is complimented by sweet sounding vocals. However, Paul Brown's programming again takes much of the enjoyment out of one of my favorite's, "Same Ole Love" from Anita Baker. Luckily this song is played with more volume by Kirk so the unimaginative programming is less distracting. Guitarist Peter White joins Kirk on "My All," the Carey megahit, giving it a languid, viscous sound that fills up the empty places in your heart. The pace picks up as Janet Jackson's "That's The Way Love Goes" flows through the speakers, and Kirk resists the urge to turn this into a piece of "elevator music," giving it a lot of feel as he makes this one to put on repeat. Kenny Lattimore's "For You" is the title cut, and first single off the album. Kirk makes this a real "sexyphone" piece as he pleads and puts his yearning into music. He notes that it's his wife's favorite song, which may explain the extra feeling he put into it. Kirk is joined by Wendy Moten on vocals for "All I Do," and gives Stevie Wonder a run for his money as to whether I prefer the original or this version. Given that Kirk played behind Whitney Houston for years, he could have chosen virtually any of her hits to put on this album, but settled on "Lover For Life." "I Want You" was a number one r&b hit for the late Marvin Gaye, but Kirk goes in a different direction with this cut. With his brother Kevin providing the vocals he goes for a more Latin-sounding arrangement, and uses his saxophone as a counterpart to the vocals, giving us a duet between brothers that makes a good argument for nepotism. The final cut was written by longtime friend Jerry Peters, who worked at Memphis Records when Kirk was under contract as a singer at the tender age of 12. Originally performed by "Friends of Distinction," "Goin' In Circles" describes what you'll keep this CD doing once it's in your player.